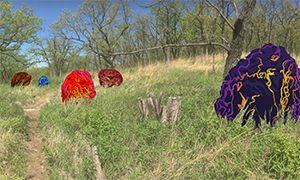 LAWRENCE — In addition to being a sculptor and printmaker, Shawn Bitters is a rockhound from Utah, which goes some way toward explaining why he’s installing a grouping of colorful, artificial boulders along a hiking trail in Kansas City. Bitters, University of Kansas associate professor of visual art, said he has been contemplating the notion of such a public art piece for years. So when he heard that the ambitious Open Spaces Kansas City Arts Experience (Aug. 25-Oct. 28 at locations around Kansas City) would be centered at woodsy Swope Park, he started scouting out locations to enact his vision. A mile-long section of the Rancho D Lux bike-hike trail in the southern part of the park, near the Go Ape! ropes course, appealed to him. Signs of previous burns in the area reminded him of the “necessary destruction” of fire in the landscape, he said. The landscape has long been Bitters’ inspiration. Right now, Bitters said, “I am mostly concerned with how we form connections to nature and how we use stories or experiences to form that connection, so I did that in an absurdist way. Bitters says he has invented and employed in his work two sets of 26 rocklike images that correlate to the letters of the alphabet. He employed these in his design for the Open Spaces installation, which he has titled “Burn Out” and which was accepted as the result of an open call. More than 100 artists from around the world have been invited to take part. For “Burn Out,” Bitters is having a set of 26 “rocks” fabricated out of thin sheets of aluminum ranging between 2 and 4 feet tall and covered seamlessly with colorful, custom-printed vinyl. These essentially two-dimensional figures will be embedded semipermanently into the ground with stakes. And despite their vivid colors, Bitters wants them to look as naturally occurring as possible. There will be a group of three of Bitters’ boulders near the entrance to the trail, where they can be seen from the road, with several other groupings scattered along the route. Fellow Open Spaces artist Ebony Patterson’s installation will be located at an abandoned swimming pool near the trailhead. “Most of the time, with my sculptural or paper pieces, it’s in a gallery and you experience it all at once,” Bitters said. “This stretches out over a mile, so you encounter my work as you experience this beautiful setting. Bitters said he hopes the natural setting will “amplify that type of exchange between me, the viewers and the environment.